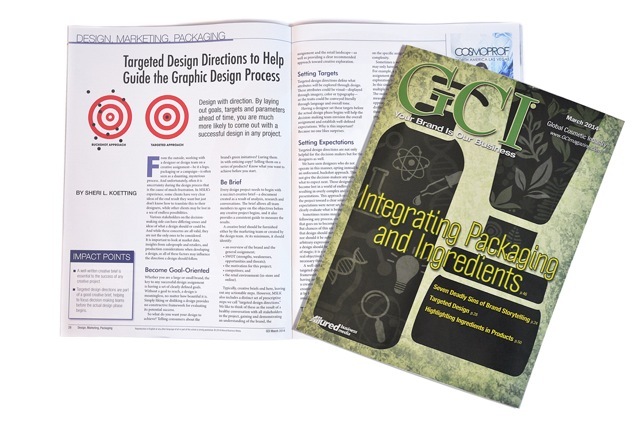 GCI beauty magazine asked MSLK to share our unique process of establishing strategies for Target Design Directions in their March 2014 issue, “Integrating Packaging and Ingredients” These strategies guide the design exploration turning subjective creative evaluation into a more objective process. A recap of this article is below. From the outside, working with a designer or design team on a creative assignment — be it a logo, packaging, or campaign — is often seen as a daunting, mysterious process. Experience has shown that uncertainty during the design process is the cause of much frustration. Some clients may have very clear ideas of the end result, but do not know how to translate this to their designers. Other clients may be lost in a sea of endless possibilities. Various other stakeholders on the decision-making side may have a differing sense of what a design should or could be. While these concerns are valid, they are not the only ones to be considered. It is important to look at market data, insights from salespeople and retailers, and production considerations. All of these factors may influence the direction a design should follow. Whether you are a large or small brand, the key to any successful design assignment is having a set of clearly-defined goals. Without a goal to reach, a design is meaningless — no matter how beautiful it is. Simply liking or disliking a design provides no constructive framework for evaluating its potential success. Every design project needs to begin with a succinct creative brief — a document created as a result of analysis, research, and conversations. The brief allows all team members to agree on the objectives before any creative project begins, and provides a consistent guide to measure the results. Typically, creative briefs end here, leaving out any actionable steps. However, our graphic design agency, MSLK goes further. We include a critical set of prescriptive steps we call “targeted design directions.” We like to think of these as the result of a healthy conversation with all stakeholders, demonstrating our keen understanding of the client, the assignment, the retail landscape, and providing a clear recommended approach toward creative exploration. Targeted design directions define what attributes will be explored through design. These attributes could be visual, displayed through imagery, color, or typography. Or, the traits could be conveyed literally through language and overall tone. Having a designer set these targets before the actual design phase begins will help the decision-making team envision the overall assignment and establish well-defined expectations. Why is this important? Because no one likes surprises! Targeted design directions are not only helpful for the decision-makers, but for the designers as well. We have seen designers who do not operate in this manner, opting instead for an unfocused, buckshot approach. This does not give the decision-makers any sense of what to expect next. Those designers tend to become lost in a world of endless variations, resulting in overly-complex and unfocused presentations. This approach never leads the client towards a clear solution. If expectations were never set, how can anyone clearly evaluate what is being shown? Sometimes teams may get lucky without following any process, creating something that goes on to become wildly successful. Chances of this are slim. The reality is that design should not exist in a vacuum, nor should it be subject to designers’ arbitrary expressions of what they “feel” a design should be. Design is not a form of magic; it is a service, which answers real objectives. Clear communication is necessary throughout the entire process. A well-defined creative brief with targeted design directions provides a solid framework to operate within, rather than an “anything goes” approach. From a creative perspective, this does not stifle creativity; it helps to focus and channel it by breaking a complex assignment into smaller problems to solve. Targeted design directions can take a number of forms, and are highly dependent on the specific assignment and its complexity. Sometimes a well-defined assignment may only have one direction to explore. For example, a smaller-scale packaging assignment may narrow down the exploration to only three to five attributes. In this situation, a designer could produce multiple variations within one target. Success of each variation can be now measured against the creative brief, as opposed to people’s arbitrary likes or dislikes. This helps uphold objectivity throughout the process, keeping everyone’s personal preferences in check. A larger-scale, more complex packaging assignment may have up to three targeted design directions identified from the outset. (Generally, we recommend a maximum of three.) Each direction should emphasize different attributes, dialing up one key area of exploration. In the case of existing brands, these directions typically include a range of exploration from an evolutionary approach to a more revolutionary one. With a process that favors a more targeted approach, the design phase can be focused. In turn, the decision-makers will be better prepared to review the resulting creative. Naturally, people will have a visceral reaction to the solutions (such as, “I love it!” or, “I am not sure about that shade of blue”), but at least everyone has a clear sense of the goals to be achieved from the outset. While there are many factors that go into a successful design, MSLK has found that a smart process from the outset helps reduce uncertainty and anxiety. Using targeted design directions before any design is created leads to a more collaborative process, helping to manage expectations and ensure better creative.